"Battle of Brooklyn" redirects here. For the college basketball rivalry, see Battle of Brooklyn (college rivalry). 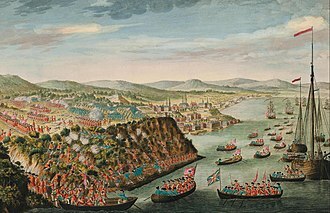 In the first stage of the war, the British Army was trapped in the peninsular city of Boston and they abandoned it on March 17, sailing to Halifax, Nova Scotia to await reinforcements. 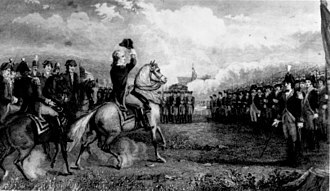 Washington then began to transfer regiments to New York City which he believed the British would next attack because of its strategic importance. Washington left Boston on April 4, arrived at New York on April 13, and established headquarters at the former home of Archibald Kennedy on Broadway facing Bowling Green. 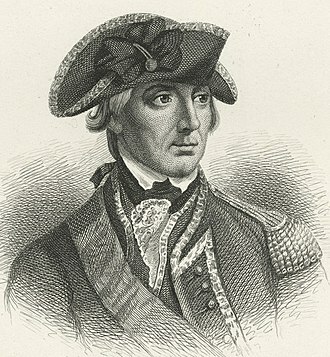 Washington had sent his second in command Charles Lee ahead to New York the previous February to establish the city's defenses. Lee remained in New York City until March, when the Continental Congress sent him to South Carolina; the defenses' construction was left to General William Alexander (Lord Stirling). Troops were in limited supply, so Washington found the defenses incomplete, but Lee had concluded that it would be impossible to hold the city with the British commanding the sea. He reasoned that the defenses should be located with the ability to inflict heavy casualties upon the British if any move was made to take and hold ground. Barricades and redoubts were established in and around the city, and the bastion of Fort Stirling across the East River in Brooklyn Heights, facing the city. Lee also saw that the immediate area was cleared of Loyalists. American strategy called for the first line of defense to be based on the Heights of Guan, a series of hills which stretched northeast across King's County. The main defensive works were a series of forts and entrenchments located in the northwest of the county, in and around Brooklyn. The "Road to Narrows" is the Gowanus Road. No. 5 is the "Old Stone House". Map by Bernard Ratzer based on his 1766-1767 survey. Washington began moving troops to Brooklyn in early May, and there were several thousand of them there in a short time. 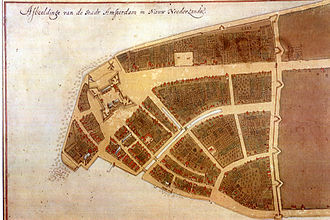 Three more forts were under construction on the eastern side of the East River to support Fort Stirling, which stood to the west of the hamlet of Brooklyn Heights. These new fortifications were Fort Putnam, Fort Greene, and Fort Box (named for Major Daniel Box). They lay from north to south, with Fort Putnam farthest to the north, Greene slightly to the southwest, and Box slightly farther southwest. Each of these defensive structures was surrounded by a large ditch, all connected by a line of entrenchments and a total of 36 cannons . Fort Defiance was also being constructed at this time, located farther southwest, past Fort Box, near present-day Red Hook. In addition to these new forts, a mounted battery was established on Governors Island, cannons were placed at Fort George facing Bowling Green, and more cannons placed at the Whitehall Dock, which sat on the East River. Hulks were sunk at strategic locations to deter the British from entering the East River and other waterways. Washington had been authorized by Congress to recruit an army of up to 28,501 troops, but he had only 19,000 when he reached New York. Military discipline was inadequate; routine orders were not carried out, muskets were fired in camp, flints were ruined, bayonets were used as knives to cut food, and firearm readiness was lax. Petty internal conflict was common under the strain of a large number of people from different environments and temperaments in relative closeness. Commander of the artillery Henry Knox persuaded Washington to transfer 400 to 500 soldiers, who lacked muskets or guns, to crew the artillery. In early June, Knox and Greene inspected the land at the north end of Manhattan and decided to establish Fort Washington. Fort Constitution, later renamed Fort Lee, was planned opposite Fort Washington on the Hudson River. The forts were hoped to discourage the British ships from sailing up the Hudson River. On June 28, Washington learned that the British fleet had set sail from Halifax on June 9 and were heading toward New York. On June 29, signals were sent from men stationed on Staten Island, indicating that the British fleet had appeared. Within a few hours, 45 British ships dropped anchor in Lower New York Bay. Less than a week later, there were 130 ships off Staten Island under the command of Richard Howe, the brother of General Howe. The population of New York went into panic at the sight of the British ships; alarms went off and troops immediately rushed to their posts. On July 2, British troops began to land on Staten Island. The continental regulars on the island took a few shots at them before fleeing, and the citizens' militia switched over to the British side. On July 6, news reached New York that Congress had voted for independence four days earlier. On Tuesday, July 9, at 18:00, Washington had several brigades march onto the commons of the city to hear the Declaration of Independence read. After the end of the reading, a mob ran down to Bowling Green with ropes and bars, where they tore down the gilded lead equestrian statue of George III of Great Britain. In their fury, the crowd cut off the statue's head, severed the nose, and mounted what remained of the head on a spike outside a tavern, and the rest of the statue was dragged to Connecticut and melted down into musket balls. On July 12, the British ships Phoenix and Rose sailed up the harbor toward the mouth of the Hudson. 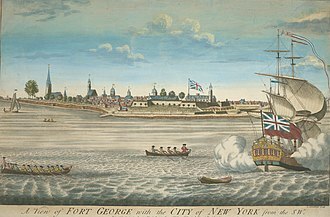 The American batteries opened fire at Fort George, Red Hook, and Governors Island, and the British returned fire into the city. The ships sailed along the New Jersey shore and continued up the Hudson, sailing past Fort Washington and arriving by nightfall at Tarrytown, the widest part of the Hudson. The goals of the British ships were to cut off American supplies and to encourage Loyalist support. The only casualties of the day were six Americans who were killed when their own cannon blew up. The next day, July 13, Howe attempted to open negotiations with the Americans. He sent a letter to Washington delivered by Lieutenant Philip Brown, who arrived under a flag of truce. The letter was addressed "George Washington, Esq." Brown was met by Joseph Reed, who had hurried to the waterfront on Washington's orders, accompanied by Henry Knox and Samuel Webb. Washington asked his officers whether it should be received or not, as it did not recognize his rank as general, and they unanimously said no. Reed told Brown that there was no one in the army with that address. On July 16, Howe tried again, this time with the address "George Washington, Esq., etc., etc. ", but it was again declined. The next day, Howe sent Captain Nisbet Balfour to ask if Washington would meet with Howe's adjutant face to face, and a meeting was scheduled for July 20. Howe's adjutant was Colonel James Patterson. Patterson told Washington that Howe had come with powers to grant pardons, but Washington said, "Those who have committed no fault want no pardon." Patterson departed soon after. Washington's performance during the meeting was praised in parts of the colonies. Meanwhile, British ships continued to arrive. On August 1, 45 ships arrived with generals Henry Clinton and Charles Cornwallis, along with 3,000 troops. By August 12, 3,000 more British troops and another 8,000 Hessians had arrived. 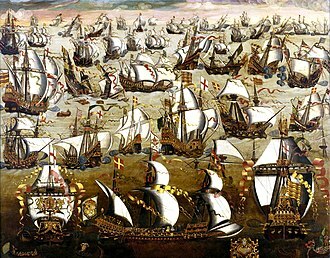 At this point, the British fleet numbered over 400 ships, including 73 war ships, and 32,000 troops were camped on Staten Island. Faced with this large force, Washington was unsure as to where the British would attack. Both Greene and Reed thought that the British would attack Long Island, but Washington felt that a British attack on Long Island might be a diversion for the main attack on Manhattan. He broke his army in half, stationing half of it on Manhattan, and the other half on Long Island; the army on Long Island was commanded by Greene. On August 20, Greene became ill and was forced to move to a house in Manhattan where he rested to recover. John Sullivan was placed in command until Greene was well enough to resume command. At 05:10 on August 22, an advance guard of 4,000 British troops left Staten Island under the command of Clinton and Cornwallis to land on Long Island. At 08:00, all 4,000 troops landed unopposed on the shore of Gravesend Bay. Colonel Edward Hand's Pennsylvanian riflemen had been stationed on the shore, but they did not oppose the landings and fell back, killing cattle and burning farmhouses on the way. By noon, 15,000 troops had landed on shore along with 40 pieces of artillery, as hundreds of Loyalists came to greet the British troops. Cornwallis pushed on with the advance guard, advancing six miles onto the island and establishing a camp at the village of Flatbush. He was given orders to advance no further. Washington received word of the landings the same day, but was informed that the number was 8,000 to 9,000 troops. This convinced him that it was the feint which he had predicted and therefore he only sent 1,500 more troops to Brooklyn, bringing the total number of troops on Long Island to 6,000. On August 24, Washington replaced Sullivan with Israel Putnam who commanded the troops on Long Island. Putnam arrived on Long Island the next day along with six battalions. Also that day, the British troops on Long Island received 5,000 Hessian reinforcements, bringing their total to 20,000. There was little fighting on the days immediately after the landing, although some small skirmishes did take place with American marksmen armed with rifles picking off British troops from time to time. The American plan was that Putnam would direct the defenses from Brooklyn Heights, while Sullivan and Stirling and their troops would be stationed on the Guan Heights. The Guan (hills) were up to 150 feet high and blocked the most direct route to Brooklyn Heights. Washington believed that, by stationing men on the heights, heavy casualties could be inflicted on the British before the troops fell back to the main defenses at Brooklyn Heights. There were three main passes through the heights; the Gowanus Road farthest to the west, the Flatbush Road slightly farther to the east, in the center of the American line where it was expected that the British would attack, and the Bedford Road farthest to the east. Stirling was responsible for defending the Gowanus Road with 500 men, and Sullivan was to defend the Flatbush and Bedford roads where there were 1,000 and 800 men respectively. Six-thousand troops were to remain behind at Brooklyn Heights. There was one lesser-known pass through the heights farther to the east called the Jamaica Pass, which was defended by just five militia officers on horses. On the British side, General Clinton learned of the almost undefended Jamaica Pass from local Loyalists. He drew up a plan and gave it to William Erskine to propose to Howe. Clinton's plan had the main army making a night march and going through the Jamaica Pass to turn the American flank, while other troops would keep the Americans busy in front. On August 26, Clinton received word from Howe that the plan would be used, and that Clinton was to command the advance guard of the main army of 10,000 men on the march through the Jamaica Pass. While they made the night march, General James Grant's British troops along with some Hessians, a total of 4,000 men, were to attack the Americans in front to distract them from the main army coming on their flank. Howe told Clinton to be ready to move out that night, August 26. At 21:00, the British moved out. No one except the commanders knew of the plan. Clinton led a crack brigade of light infantry with fixed bayonets in front, followed by Cornwallis who had eight battalions and 14 artillery pieces. Cornwallis was followed by Howe and Hugh Percy with six battalions, more artillery, and baggage. The column consisted of 10,000 men who stretched out over two miles. Three Loyalist farmers led the column toward the Jamaica Pass. The British had left their campfires burning to deceive the Americans into thinking that nothing was happening. The column headed northeast until it reached what later became the village of New Lots, when it headed directly north toward the heights. The column had yet to run into any American troops when they reached Howard's Tavern (also known as Howard's Half-Way House), just a few hundred yards from the Jamaica Pass. Tavern keeper William Howard and his son William Jr. were forced to act as guides to show the British the way to the Rockaway Foot Path, an old Indian trail that skirted the Jamaica Pass to the west (located today in the Cemetery of the Evergreens). Five minutes after leaving the tavern, the five American militia officers stationed at the pass were captured without a shot fired, as they thought that the British were Americans. Clinton interrogated the men and they informed him that they were the only troops guarding the pass. By dawn, the British were through the pass and stopped so that the troops could rest. At 09:00, they fired two heavy cannons to signal the Hessian troops below Battle Pass to begin their frontal assault against Sullivan's men deployed on the two hills flanking the pass, while Clinton's troops simultaneously flanked the American positions from the east. It was about two in the morning of August 27 that I was awakened by seeing a soldier at the side of my bed. I got up and dressed and went down to the barroom, where I saw my father standing in one corner with three British soldiers before him with muskets and bayonets fixed. The army was then lying in the field in front of the house.... General Howe and another officer were in the barroom. General Howe wore a camlet cloak over his regimentals. After asking for a glass of liquor from the bar, which was given him, he entered into familiar conversation with my father, and among other things said, "I must have some one of you to show me over the Rockaway Path around the pass." My father replied, "We belong to the other side, General, and can’t serve you against our duty." General Howe replied, "That is alright; stick to your country, or stick to your principles, but Howard, you are my prisoner and must guide my men over the hill." My father made some further objection, but was silenced by the general, who said, "You have no alternative. If you refuse I shall shoot you through the head. A view from Battle Hill - the highest point in King's County - looking west toward Upper New York Harbor and New Jersey beyond.. Here on Lord Stirling's left flank about 300 Americans under Colonel Atlee and General Parsons repulsed successive attacks by the British after taking the hill, and inflicted the highest casualties against the British during the Battle of Long Island. 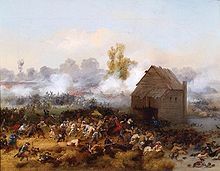 At about 23:00 on August 26, the first shots were fired in the Battle of Long Island, near the Red Lion Inn (near present-day 39th Street and 4th Avenue). American pickets from Samuel John Atlee's Pennsylvania regiment fired upon two British soldiers who were foraging in a watermelon patch near the inn. Around 01:00 on August 27, the British approached the vicinity of the Red Lion with 200–300 troops. The American troops fired upon the British; after approximately two fusillades, they fled up the Gowanus Road toward the Vechte-Cortelyou House. Major Edward Burd had been in command, but he was captured along with a lieutenant and 15 privates. This first engagement was fought in the vicinity of 38th and 39th streets between 2nd and 3rd avenues near a swamp located adjacent to the Gowanus Road. Brigadier General Samuel Holden Parsons and Colonel Atlee were stationed farther north on the Gowanus Road. Parsons was a lawyer from Connecticut who had recently secured a commission in the Continental Army; Atlee was a veteran of the French and Indian War in command of the First Regiment of Pennsylvania Musketry. Putnam had been awakened by a guard at 03:00 and told that the British were attacking through the Gowanus Pass. He lit signals to Washington, who was on Manhattan, and then rode south to warn Stirling of the attack. Stirling led two units of Colonel John Haslet's 1st Delaware Regiment under the immediate command of Major Thomas Macdonough, and Colonel William Smallwood's 1st Maryland Infantry under the immediate command of Major Mordecai Gist; both Haslet and Smallwood were on courts-martial duty in Manhattan. Following close behind was Parson's Connecticut regiment with 251 men. Stirling led this combined force to reinforce Parsons and Atlee and stop the British advance. Stirling had a total of 1,600 troops at his command. Stirling took up positions with the Delaware and Maryland regiments just to the north of Atlee's men on the slopes of a rise of land between 18th and 20th streets. Some of the Maryland troops were positioned on a small hill near 23rd Street, which the local Dutch called "Blokje Berg" (Dutch for cube or block hill). At the base of this hill, the Gowanus Road crossed a small bridge over a ditch which drained a marshy area. When the British advanced up the Gowanus Road, the American troops fired upon them from positions on the north side of the ditch. To the left was Colonel Peter Kachline's Pennsylvania regiment. Just to the southeast of Blokje Berg were a few hills; amongst them was a hill which is the highest point in King's County at 220 feet which came to be known as "Battle Hill," in what is today Greenwood Cemetery by the cemetery's boundary of 23rd Street and 7th Avenue. The British attempted to outflank the American positions by taking this hill. The Americans tried to prevent the British move, sending troops under Parsons and Atlee to take the hill. The British got there first but the Americans were able to dislodge them in fierce fighting. Battle Hill was the site of especially brutal fighting, with the Americans inflicting the highest number of casualties against the British troops during the entire Battle of Long Island. Among those killed was British Colonel James Grant, which led the Americans to believe that they had killed General James Grant. He was alleged to have been shot by a Pennsylvanian rifleman who had been sniping at the British from up in a tree. Among the American dead was Pennsylvania Colonel Caleb Parry, who was killed while rallying his troops. The Americans were still unaware that this was not the main British attack, in part due to the ferocity of the fighting and the number of British troops engaged. The Hessians, in the center under the command of General von Heister, began to bombard the American lines stationed at Battle Pass under the command of General John Sullivan. The Hessian brigades did not attack, as they were waiting for the pre-arranged signal from the British, who were in the process of outflanking the American lines at that time. The Americans were still under the assumption that Grant's attack up the Gowanus Road was the main thrust, and Sullivan sent four-hundred of his men to reinforce Stirling. Howe fired his signal guns at 09:00 and the Hessians began to attack up Battle Pass, while the main army came at Sullivan from the rear. Sullivan left his advance guard to hold off the Hessians while he turned the rest of his force around to fight the British. Heavy casualties mounted between the Americans and the British, and men on both sides fled out of fear. Sullivan attempted to calm his men and tried to lead a retreat. By this point, the Hessians had overrun the advance guard on the heights and the American left had completely collapsed. Hand-to-hand fighting followed, with the Americans swinging their muskets and rifles like clubs to save their own lives. It was later claimed, Americans who surrendered were bayoneted by the Hessians. Sullivan, despite the chaos, managed to evacuate most of his men to Brooklyn Heights though he himself was captured. The front of the original Vechte-Cortelyou House, where the Maryland troops commanded by Lord Stirling and Mordecai Gist made two attacks against over two thousand British troops in a rear-guard action that allowed a majority of Stirling's 1,600-strong command to escape. At 09:00, Washington arrived from Manhattan. 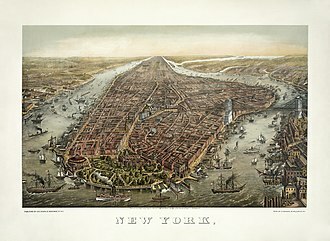 He realized that he had been wrong about a feint on Long Island and he ordered more troops to Brooklyn from Manhattan. His location on the battlefield is not known because accounts differ, but most likely he was at Brooklyn Heights where he could view the battle. Stirling still held the line against Grant on the American right, to the west. He held on for four hours, still unaware of the British flanking maneuver, and some of his own troops thought that they were winning the day because the British had been unable to take their position. However, Grant was reinforced by 2,000 marines, and he hit Stirling's center by 11:00, and Stirling was attacked on his left by the Hessians. Stirling pulled back, but British troops were coming at him from the rear, south down the Gowanus Road. The only escape route left was across a Brouwer's millpond on the Gowanus Creek which was 80 yards wide, on the other side of Brooklyn Heights. The American troops who were not killed or captured escaped behind the fortified American positions centered on Brooklyn Heights. Howe then ordered all of his troops to halt the attack, in a move considered controversial to this day, despite the protests of many officers in his command who believed that they should push on to Brooklyn Heights. Howe had decided against a direct frontal assault against the entrenched American positions, choosing instead to begin a siege and setting up lines of circumvallation around the American positions. 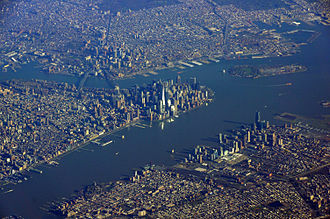 He believed the Americans to be essentially trapped, with his troops blocking escape by land and the Royal Navy in control of the East River, which they would have to cross to reach Manhattan Island. Washington and the army were surrounded on Brooklyn Heights with the East River to their backs. As the day went on, the British began to dig trenches, slowly coming closer to the American defenses. By doing this, the British would not have to cross over open ground to assault the American defenses as they did in Boston the year before. Despite this perilous situation, Washington ordered 1,200 more men from Manhattan to Brooklyn on August 28. The men that came over were two Pennsylvania regiments and Colonel John Glover's regiment from Marblehead, Massachusetts. In command of the Pennsylvanian troops was Thomas Mifflin who, after arriving, volunteered to inspect the outer defenses and report back to Washington. In these outer defenses, small skirmishes were still taking place. On the afternoon of August 28, it began to rain and Washington had his cannons bombard the British well into the night. As the rain continued, George Washington sent a letter instructing General William Heath, who was at Kings Bridge between Manhattan and what is now the Bronx, to send every flat-bottomed boat and sloop without delay, in case battalions of infantry from New Jersey came to reinforce their position. 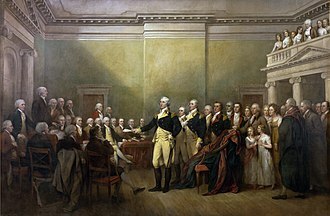 At 16:00, on August 29, Washington held a meeting with his generals. Mifflin advised Washington to retreat to Manhattan while Mifflin and his Pennsylvania regiments made up the rear guard, holding the line until the rest of the army had withdrawn. The generals agreed unanimously with Mifflin that retreat was the best option and Washington had orders go out by the evening. The troops were told that they were to gather up all their ammunition and baggage and prepare for a night attack. By 21:00, the sick and wounded began to move to the Brooklyn Ferry in preparation for evacuation. At 23:00, Glover and his Massachusetts men, who were sailors and fishermen, began to evacuate the troops. As more troops were evacuated, more were ordered to withdraw from the lines and march to the ferry landing. Wagon wheels were muffled, and men were forbidden to talk. Mifflin's rear guard was tending campfires to deceive the British. At 04:00, on August 30, Mifflin was informed that it was his unit's turn to evacuate. Mifflin told the man who had been sent to order him to leave, Major Alexander Scammell, that he must be mistaken, but Scammell insisted that he was not and Mifflin ordered his troops to move out. When Mifflin's troops were within a half mile of the ferry landing, Washington rode up and demanded to know why they were not at their defenses. Edward Hand, who was leading the troops, tried to explain what had happened, but Mifflin arrived shortly. Washington exclaimed "Good God. General Mifflin, I am afraid you have ruined us." Mifflin explained that he had been told that it was his turn to evacuate by Scammell; Washington told him it had been a mistake. Mifflin then led his troops back to the outer defenses. Artillery, supplies, and troops were all being evacuated across the river at this time but it was not going as fast as Washington had anticipated and daybreak soon came. A fog settled in and concealed the evacuation from the British. British patrols noticed that there did not seem to be any American pickets and thus began to search the area. While they were doing this, Washington, the last man left, stepped onto the last boat. At 07:00, the last American troops landed in Manhattan. All 9,000 troops had been evacuated with no loss of life. The British were stunned to find that Washington and the army had escaped. Later in the day, August 30, the British troops occupied the American fortifications. 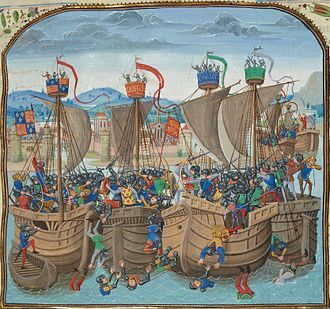 When news of the battle reached London, it caused many festivities to take place. Bells were rung across the city, candles were lit in windows and King George III gave Howe the Order of the Bath. 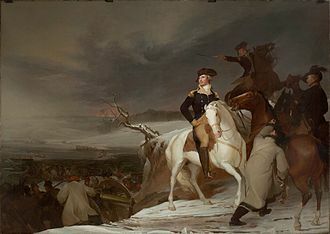 Washington's defeat revealed his deficiencies as a strategist who split his forces, his inexperienced generals who misunderstood the situation, and his raw troops that fled in disorder at the first shots. However, his daring nighttime retreat has been seen by some historians as one of his greatest military feats. Other historians concentrate on the failure of British naval forces to prevent the withdrawal. 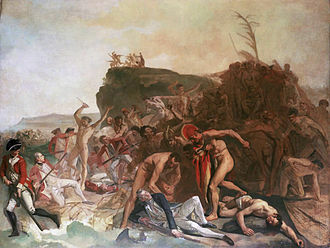 Howe remained inactive for the next half month, not attacking until September 15 when he landed a force at Kip's Bay. The British quickly occupied the city. On September 21, a fire of uncertain origin destroyed a quarter of New York City. In the immediate aftermath of the fire Nathan Hale was executed for spying. Although American troops delivered an unexpected check to the British at Harlem Heights in mid-September, Howe defeated Washington in battle again at White Plains and then again at Fort Washington. Because of these defeats, Washington and the army retreated across New Jersey and into Pennsylvania. Historians believe that as many as 256 soldiers of the First Maryland Regiment under Colonel William Smallwood fell in the battle, about two-thirds of the regiment. It is known that they were buried in a mass-grave, but the grave's exact location has been a mystery for 240 years. In 2012 Brooklyn historian and president of the Brooklyn Preservation Council, Robert Furman, stated that he had a strong suspicion of the location of the gravesite, believing it to be in an empty lot in the Gowanus section of Brooklyn. In 2017, in advance of the construction of a school on the Gowanus empty lot where Furman believes the mass grave is located, Furman and American Legion Michael A. Rawley Post 1636 urged archeologist to dig up the lot in search of the mass grave. However, subsequent digs at the location found no human remains on the site and the school was constructed. The Altar to Liberty: Minerva monument: The battle is commemorated with a monument, which includes a bronze statue of Minerva near the top of Battle Hill, the highest point of Brooklyn, in Green-Wood Cemetery. The statue was sculpted by Frederick Ruckstull and unveiled in 1920. The statue stands in the northwest corner of the cemetery and gazes directly at the Statue of Liberty in New York Harbor. In 2006, the Minerva statue was invoked in a successful defense to prevent a building from blocking the line of sight from the cemetery to the Statue of Liberty in the harbor. The annual Battle of Long Island commemoration begins inside the main Gothic arch entrance to Green-Wood Cemetery and marches up Battle Hill to ceremonies at the monument. The Prison Ship Martyrs' Monument: A freestanding Doric column in Fort Greene memorializing all those who died while kept prisoner on the British ships just off the shore of Brooklyn, in Wallabout Bay. 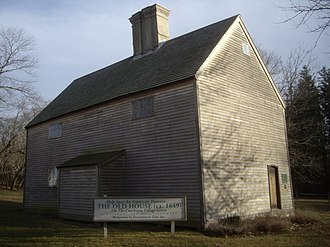 The Old Stone House: A re-constructed farmhouse (c.1699) that was at the center of the Marylanders' delaying actions serves as a museum of the battle. It is located in J.J. Byrne Park, at Third Street and Fifth Avenue, Brooklyn, and features models and maps. Prospect Park, Brooklyn, Battle Pass: along the eastern side of Center Drive in Prospect Park, Brooklyn, is a large granite boulder with a brass plaque affixed, and another marker lies near the road for the Dongan Oak, a very large and old tree felled to block the pass from the British advance. In addition, in the park resides the Line of Defense marker erected by the Sons of the American Revolution and, near the eastern edge of Long Meadow, the Maryland Monument& Maryland Memorial corinthian column. There are only thirty currently existing units in the U.S. Army with lineages that go back to the colonial and revolutionary eras. Five Army National Guard units (101st Eng Bn, 125th MP Co, 175th Inf, 181st Inf and 198th Sig Bn) and one Regular Army Field Artillery battalion (1-5th FA) are derived from American units that participated in the Battle of Long Island. ^ The 256 dead troops of the Maryland 400 were buried by the British in a mass grave on a hillock on farmer Adrian Van Brunt's land on the outskirts of the marsh. It was from this battle that Maryland gained its nickname the "Old Line State". This mass grave is believed to be around the southwest corner of what is today Third Avenue, between Seventh and Eighth streets. ^ David Syrett (June 15, 2005). Admiral Lord Howe. Naval Institute Press. p. 61. ISBN 978-1-59114-006-1. Retrieved December 3, 2012. ^ "Box Fort - The New York State Military Museum". ^ Field 1869, p. 144. ^ a b McCullough 2006, p. 139. ^ a b c McCullough 2006, p. 166. 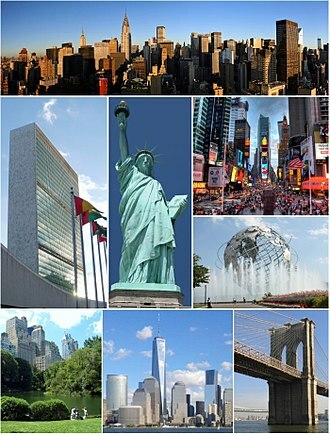 ^ "The Campaign of 1776 Around New York and Brooklyn". Long island historical society. January 1, 1878 – via Google Books. ^ Stiles, Henry (March 1, 2012). "A History of the City of Brooklyn". Applewood Books – via Google Books. ^ Johnston 1878, pp. 161-164. ^ McCullough 2006, p. 171. ^ Lengel 2005, p. 143. ^ Johnston 1878, pp. 169-171. ^ Johnston 1878, pp. 169-172. ^ "The narrative of Lieutenant General William Howe". Retrieved July 27, 2012. p 5. 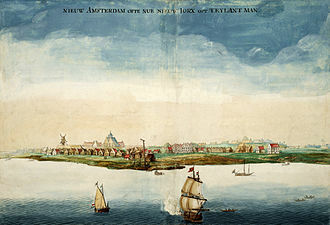 ^ "Foot Of Wall Street And Ferry-House, 1746". ^ a b c d Lewis, Charles H. (2009). Cut Off: Colonel Jedediah Huntington's 17th Continental (Conn.) Regiment at the Battle of Long Island August 27, 1776. Westminster, MD: Heritage Books. p. 190. ISBN 978-0-7884-4924-6. ^ Burke, Justin (August 25, 2012). "Seeking Brooklyn's Lost Mass Grave". New York Times. Retrieved March 29, 2017. ^ "Vacant Brooklyn lot could be site of mass grave for Revolutionary War soldiers, historian says". New York's PIX11 / WPIX-TV. March 25, 2017. Retrieved March 29, 2017. ^ Elizabeth Hays (May 7, 2008). "Developer says plan respects Minerva statue's point of view". New York: NY Daily News. Archived from the original on February 20, 2009. Retrieved February 2, 2009. ^ Fort Greene Park Conservancy. "Prison Ship Martyrs' Monument". Fort Greene Park Conservancy. Archived from the original on August 2, 2008. Retrieved February 2, 2009. ^ NYC Department of Parks and Recreation. "Old Stone House". NYC Department of Parks and Recreation. Archived from the original on January 23, 2009. Retrieved February 2, 2009. ^ "Find A Grave: Maryland Monument". ^ NYC Department of Parks and Recreation. "Prospect Park". NYC Department of Parks and Recreation. Archived from the original on March 3, 2009. Retrieved February 2, 2009. ^ "Department of the Army, Lineage and Honors, 125th Quartermaster Company". Archived from the original on December 18, 2014. ^ "1st Battalion, 5th Field Artillery Regiment". Wikimedia Commons has media related to Battle of Long Island. Wikisource has the text of a 1911 Encyclopædia Britannica article about Battle of Long Island. The Staten Island Peace Conference was a brief meeting held in the hope of bringing an end to the American Revolutionary War. The conference took place on September 11,1776, at Billop Manor, the participants were the British Admiral Lord Richard Howe, and members of the Second Continental Congress John Adams, Benjamin Franklin, and Edward Rutledge. 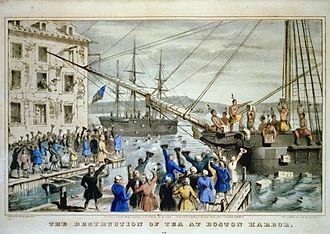 Since Lord Howes authority was, by design, extremely limited, the conference, held in the days after the British capture of Long Island, lasted just three hours and was a failure. The Americans insisted on recognition of their declared independence. After the conference, the British continued their campaign for control of New York City. When British authorities were planning how to deal with their rebellious North American colonies in late 1775 and early 1776, two brothers, Admiral Lord Richard Howe and General William Howe, were given command of the naval and land aspects of the operation respectively. Since they believed it still be possible to end the dispute without further violence. 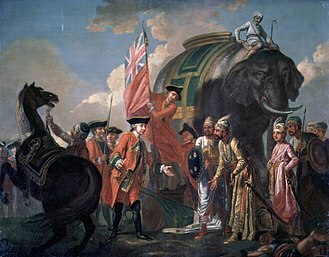 Admiral Howe had previously discussed colonial grievances informally with Benjamin Franklin in 1774 and 1775, General Howe believed that the problem of colonial taxation could be resolved while retaining the supremacy of Parliament. As a consequence, the Howes were only granted the ability to issue pardons and amnesties, no concessions could be made unless hostilities were ended and colonial assemblies made specific admissions of Parliamentary supremacy. After the fleet arrived in July 1776, Admiral Howe made several attempts to open communications with Continental Army General George Washington, two attempts to deliver letters to Washington were rebuffed because Howe refused to recognize Washingtons title. Washington did however agree to meet in person with one of Howes adjutants, Lord Howe sent a letter to Benjamin Franklin detailing a proposal for a truce and offers of pardons. He pointed out to the admiral that you gave me expectations that reconciliation might take place. Howe was apparently taken aback by Franklins forceful response. Turtle was the worlds first submersible with a documented record of use in combat. She was built in Old Saybrook, Connecticut in 1775 by American David Bushnell as a means of attaching explosive charges to ships in a harbor, Bushnell designed her for use against British Royal Navy vessels occupying North American harbors during the American Revolutionary War. Several attempts were made using Turtle to affix explosives to the undersides of British warships in New York Harbor in 1776, all failed, and her transport ship was sunk that year by the British with the submarine aboard. Bushnell claimed eventually to have recovered the machine, but its fate is unknown. In the early 1770s, David Bushnell, a Yale College freshman and Patriot, by 1775, with tensions on the rise between the Thirteen Colonies and Great Britain, Bushnell had practically perfected these explosives. That year he began work near Old Saybrook, Connecticut on a small manned submersible craft capable of affixing such a charge to the hull of a ship. The charge would be detonated by a mechanism that released a musket firing mechanism, probably a flintlock. According to Dr. Benjamin Gale, a doctor who taught at Yale and it dived by allowing water into a bilge tank at the bottom of the vessel and ascended by pushing water out through a hand pump. It was propelled vertically and horizontally by hand-cranked propellers and it had 200 pounds of lead aboard, which could be released in a moment to increase buoyancy. Manned and operated by one person, the vessel contained enough air for thirty minutes and had a speed in calm water of about 3 mph. Six small pieces of glass in the top of the submarine provided natural light. The internal instruments had small pieces of bioluminescent foxfire affixed to the needles to indicate their position in the dark, during trials in November 1775, Bushnell discovered that this illumination failed when the temperature dropped too low. Although repeated requests were made to Benjamin Franklin for possible alternatives, none was forthcoming, Bushnells basic design included some elements present in earlier experimental submersibles. Lieutenant-General Sir William Erskine, 1st Baronet was a British Army commander and the 1st Baronet of the Erskine of Torrie creation. Erskine was the son of Colonel the Honourable William Erskine of Torrie, Deputy Governor of Blackness Castle, Erskine first married Magdalen Myrton, daughter of Robert Myrton of Gogar, and Frances Moray, daughter of James Moray of Abercairny. His eldest son by his wife, William. He had another son, who was an officer in the 133rd Foot and his third son John, became baronet, on the death of his brother James. Erskine joined his father’s regiment the 7th Dragoons in 1742 and served in the War of the Austrian Succession, seeing action at the Battle of Fontenoy, in the Seven Years War. By March 1759 he was in Germany with the rank of Major in the 15th Light Dragoons, Erskine performed exceptionally on the field at the Battle of Emsdorf and was able to present King George III with 16 colors captured by his regiment. For his prowess, Erskine was knighted, Erskine was posted to America in 1776 as a Brigadier staff officer under Clinton, seeing action in the New York campaign and commanding the 7th Brigade at Long Island 27 August 1776. In 1777 he was Quartermaster-General to Lord Cornwallis, Erskine is credited with advising Cornwallis on the occasion of the Battle of the Assunpink Creek not to put off attacking the Continental Army on the night of 2 January 1777. The Continental forces moved away by night, fighting the Battle of Princeton on 3 January, Erskine was made Colonel of the 80th Foot on 4 March 1777. Erskine served in the Philadelphia campaign and then, following Sir William Howes resignation in 1778, Erskine went on to lead troops at the Battle of Monmouth and after that campaign was given command of the eastern district of Long Island. Promoted Major-General on 19 February 1779, Erskine sailed for London the same year and he became Colonel-in-Chief of the 26th Foot in 1782. On 28 September 1787 he was promoted Lieutenant-General and he became a baronet in 1791. After the declaration of war with revolutionary France he served on the staff of the Duke of York in the Flanders Campaign from late 1793. He was present with York at the Siege of Dunkirk from 25 August to 10 September, Erskine was given command of the army during York’s absence through the Winter of 1793/1794. 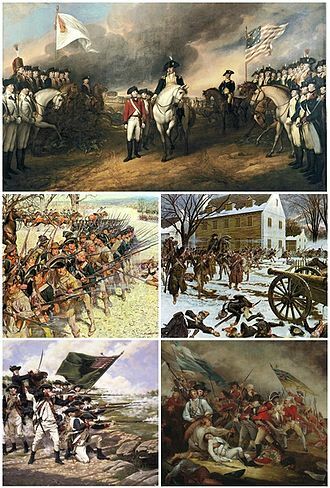 The Battle of Harlem Heights was fought during the New York and New Jersey campaign of the American Revolutionary War. The action took place in what is now the Morningside Heights, immediately opposite was the vanguard of the British Army totaling around 5,000 men under the command of Major General Henry Clinton. The overconfident British light troops, having advanced too far from their lines without support, had exposed themselves to counter-attack, meeting reinforcements coming from the south with artillery support, the British light infantry turned and made a stand in open fields on Morningside Heights. The Americans, came on in strength and there followed an exchange of fire. After two hours, with ammunition running short, the British force began to back to their lines. 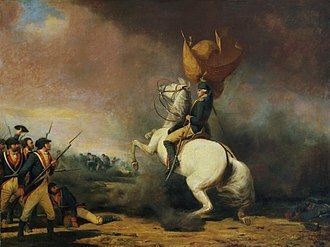 Washington cut short the pursuit, unwilling to risk an engagement with the British main force. 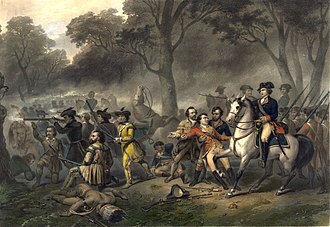 The battle helped restore the confidence of the Continental Army after suffering several defeats and it was Washingtons first battlefield success of the war. After two defeats Washington retreated west across the Hudson River, on August 27,1776, British troops under the command of General William Howe flanked and defeated the American army at the Battle of Long Island. Howe moved his forces and pinned the Americans down at Brooklyn Heights, on the night of August 29, General George Washington, Commander-in-Chief of the Continental Army, evacuated his entire army of 9,000 men and their equipment across the water to Manhattan. 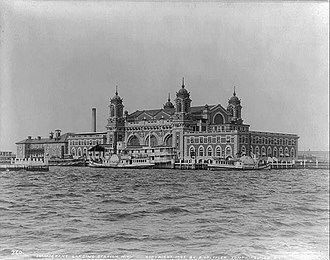 On September 15, Howe landed his army in an operation at Kips Bay, on the eastern shore of Manhattan. After a bombardment of the American positions on the shore,4,000 British, after scattering the Americans at Kips Bay, Howe landed 9,000 more troops, but did not immediately cut off the American retreat from New York Town in the south of the island. Washington had all of his troops in the city on their way to north along the westside of Manhattan to Harlem Heights by 4,00 pm, early on September 16, Washington received reports, which proved to be unfounded, that the British were advancing. 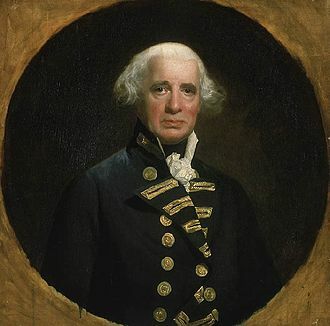 General William Howe, 5th Viscount Howe, KB, PC was a British Army officer who rose to become Commander-in-Chief of British forces during the American War of Independence. Howe was one of three brothers who had distinguished military careers, having joined the army in 1746, Howe saw extensive service in the War of the Austrian Succession and Seven Years War. Howe participated in the campaigns to take Louisbourg, Belle Île and he was appointed Lieutenant-Governor of the Isle of Wight, a post he would hold until 1795. Howe was sent to North America in March 1775, arriving in May after the American War of Independence broke out. After leading British troops to a victory in the Battle of Bunker Hill. Howes record in North America was marked by the capture of both New York City and Philadelphia. However, poor British campaign planning for 1777 contributed to the failure of John Burgoynes Saratoga campaign, Howes role in developing those plans and the degree to which he was responsible for British failures that year have both been subjects of contemporary and historic debate. He resigned his post as Commander in Chief, North America, in 1778, and returned to England and he served for many years in Parliament, and was knighted after his successes in 1776. He inherited the Viscountcy of Howe upon the death of his brother Richard in 1799 and he married, but had no children, and the viscountcy was extinguished with his death in 1814. His mother was a regular in the courts of George II and this connection with the crown may have improved the careers of all four sons, but all were very capable officers. His father was a politician, who served as Governor of Barbados where he died in 1735, williams eldest brother, General George Howe, was killed just before the 1758 Battle of Carillon at Fort Ticonderoga. Another brother, Admiral Richard Howe, rose to one of Britains leading naval commanders. A third brother, commanded ships for the East India Company, Winchelsea in 1762–4 and Nottingham in 1766, William entered the army when he was 17 by buying a cornets commission in the Duke of Cumberlands Dragoons in 1746. The British troops wanted to have fresh provisions to consume, and required fresh forage for their draft animals and horses. 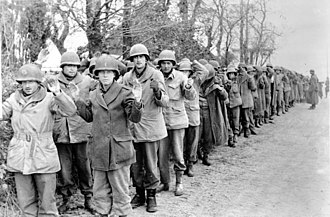 While many of these operations were small, in some cases they became quite elaborate, the American operations were so successful that British casualties in New Jersey exceeded those of the entire campaign for New York. In August 1776 the British army began a campaign to control over New York City. Over the next two months, General William Howe quickly gained control of New York, pushing Washington into New Jersey and he chased Washington south toward Philadelphia. 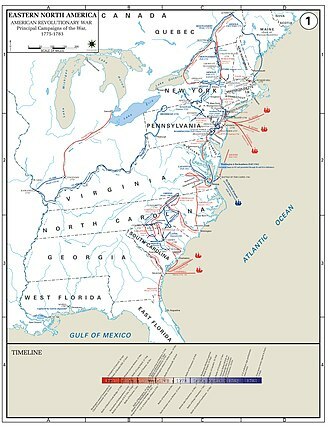 Washington retreated across the Delaware River into Pennsylvania, taking him all the boats for miles in each direction. Howe ordered his army into winter quarters, establishing a chain of outposts across New Jersey, from the Hudson River through New Brunswick to Trenton and Bordentown on the Delaware River. The occupation of New Jersey by British and German troops caused friction with the local communities, on the night of December 25–26,1776, Washington crossed the Delaware and surprised the Trenton outpost the following morning. Over the next two weeks, he went on to win two further battles at Assunpink Creek and Battle of Princeton, leading the British to retreat to northern New Jersey. General Washington established his headquarters at Morristown, separated from the coast by the Watchung Mountains, over the course of January and February, Washingtons Continental Army shrank to about 2,500 regulars after Washingtons incentives for many men to overstay their enlistment periods ran out. 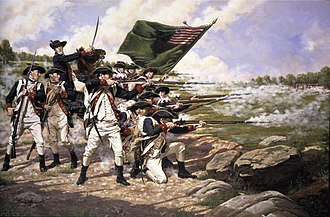 A large number of militia from New Jersey, New York, and Pennsylvania bolstered these forces, the British army was initially deployed from posts as far north as Hackensack to New Brunswick. The garrison, numbering about 10,000, was concentrated between New Brunswick and Amboy, with a sizable contingent farther north, from Elizabethtown to Paulus Hook, militia pressure in January led General Cornwallis to withdraw most of the northern troops to the shores of the Hudson. The area had been heavily plundered during the American retreat in the fall, the men subsisted largely on rations such as salt pork, but their draft animals required fresh fodder, for which they sent out raiding expeditions. Early in the winter, Washington sent out detachments of troops to remove any remaining provisions. General Cornwallis sent out small foraging and raiding parties in January and these were met by larger formations of American militia companies, sometimes with Continental Army support, that led on occasion to significant casualties. In one early example, Brigadier General Philemon Dickinson mustered 450 militia, Washington gave his commanders wide latitude in how to act, issuing commands that they were to be constantly harassing the enemy, and that they should be aggressive in their tactics. These early successes depended in part on successful intelligence, one British commander reported being met with force notwithstanding the Orders were given and their difficulties led British commanders to change tactics, attempting to lure these militia units into traps involving larger numbers of British regulars. In one encounter in late February, British Colonel Charles Mawhood, thinking he had flanked a party of New Jersey militia, as they were driven back toward Amboy and more Americans appeared, ultimately inflicting about 100 casualties. John Sullivan was an American General in the Revolutionary War, a delegate in the Continental Congress, Governor of New Hampshire and a United States federal judge. Sullivan, the son of Irish settlers, served as a major general in the Continental Army. He commanded the Sullivan Expedition in 1779, a scorched earth campaign against the Iroquois towns that had taken up arms against the American revolutionaries, as a member of Congress, Sullivan worked closely with the French Ambassador the Chevalier de la Luzerne. Born in Somersworth in the Province of New Hampshire, Sullivan was the son of Irish settlers from the Beara Peninsula in County Cork. One of his brothers, James Sullivan, became Governor of Massachusetts, another brother, who served in the Royal Navy died before the American Revolution. A landing party from HMS Allegiance on February 14,1781 kidnapped another brother, Captain David Sullivan, who died of disease. The father, John Owen OSullivan was the son of Philip OSullivan of Beare of Ardea, minor gentry in Penal Ireland, the Penal Laws reduced them to the status of peasants. After emigrating to York, Maine, in 1723, the elder John became a Protestant, in 1760, Sullivan married Lydia Remick Worster of Kittery, now in Maine. John and Lydia Sullivan had six children, who died in infancy, John, James and another Margery, Sullivan read law with Samuel Livermore of Portsmouth, New Hampshire between 1758 and 1760. He began the practice of law in 1763 at Berwick, now in Maine and he annoyed many neighbors in his early career, when he was the only lawyer in town, with numerous suits over foreclosures and was threatened with violence at least twice in 1766. But by 1772, he was established and began work to improve his relations with the community. He expanded his interests into milling from which he made a substantial income, in 1773 Alexander Scammell joined John Sullivans law practice. Sullivan built a friendship with the governor of New Hampshire, John Wentworth. In November 1772, Wentworth appointed Sullivan a major in the militia, as the American Revolution grew nearer, Sullivan turned away from Wentworth and began to side more with the radicals. Fort Lee Historic Park is located atop a bluff of the Hudson Palisades overlooking Burdetts Landing, known as Mount Constitution, in Fort Lee, New Jersey. Native Americans appear to have lived in the area for thousands of years before the arrival of Europeans, site of George Washingtons 1776 encampment opposite Fort Washington at the northern end of Manhattan. Fort Lee is named for General Charles Lee, the site is a reconstruction of the encampment including the blockhouse, quarters as well as a visitors center. It is adjacent to Palisades Interstate Park, General George Washington issued orders to General Mercer to summon all available troops and erect a fort on the west side of the Hudson River. Construction commenced in July 1776 on the new fort, to be called Fort Constitution and it was located on the western side of the road that led up the hill from the landing. Concurrently, Fort Washington was being built almost directly across the North River in New York, chevaux-de-frise, south of the Hudson River Chain, were laid between them. These twin forts were intended to protect the lower Hudson from British warships, at first efforts were concentrated close to the water level near Burdetts Landing. Later, fortifications were added atop the bluff under the supervision of Joseph Philips, at the end of September 1776, Fort Constitution was renamed Fort Lee, for General Charles Lee of the Continental Army. George Washington used the stone Bourdette house for his headquarters when he passed time at Fort Lee, at this stage of the war the ferry operated as a supply line and the only link between Forts Lee and Washington. Peter Bourdettes sixteen-year-old son, named Peter, provided assistance by direct use of the landing, during the week leading up to the evacuation of Fort Lee he rowed back and forth across the river gathering information for General Washington on the anticipated movements of the British forces. On November 16,1776 George Washington witnessed the battle for New York from across the river on the bluff of Fort Lee, Fort Lee was rendered defenseless after Continental Army troops holding Fort Washington were defeated and captured on November 16,1776. The Royal Navy controlled the Hudson River, General William Howe ordered Charles Cornwallis to clear the rebel troops from New Jersey without a major engagement, and to do it quickly before the weather changed. The force included Hessian units commanded by Colonel Carl von Donop, the invasion of New Jersey began the night of November 19–20, when 5,000 British troops ferried across the Hudson on barges and began landing near New Dock Landing. George Washington and Nathanael Greene quickly ordered the evacuation of the fort on the morning of November 20,1776, Fort Lee Museum is located in Monument Park. Which was created by the Daughters of the American Revolution and dedicated in 1908 at ceremony attended by General John Black Jack Pershing, the park was part of the original Fort Constitution of the Continental Army under the leadership of General George Washington. Over 2,600 troops were stationed in and around the Monument Park area, in 2004, the park was reconstructed for the Fort Lee Centennial Celebration. The Battle of Trenton was a small but pivotal battle during the American Revolutionary War which took place on the morning of December 26,1776, in Trenton, New Jersey. After a brief battle, nearly the entire Hessian force was captured, the battle significantly boosted the Continental Armys flagging morale, and inspired re-enlistments. The Continental Army had previously suffered several defeats in New York and had forced to retreat through New Jersey to Pennsylvania. Because the river was icy and the severe, the crossing proved dangerous. Two detachments were unable to cross the river, leaving Washington with only 2,400 men under his command in the assault, the army marched 9 miles south to Trenton. The Hessians had lowered their guard, thinking they were safe from the American army, Washingtons forces caught them off guard and, after a short but fierce resistance, most of the Hessians surrendered. Almost two thirds of the 1, 500-man garrison was captured, and only a few troops escaped across Assunpink Creek, despite the battles small numbers, the American victory inspired rebels in the colonies. With the success of the revolution in doubt a week earlier, the dramatic victory inspired soldiers to serve longer and attracted new recruits to the ranks. In early December 1776, American morale was very low, the Americans had been ousted from New York by the British and their Hessian auxiliaries, and the Continental Army was forced to retreat across New Jersey. Ninety percent of the Continental Army soldiers who had served at Long Island were gone, men had deserted, feeling that the cause for independence was lost. 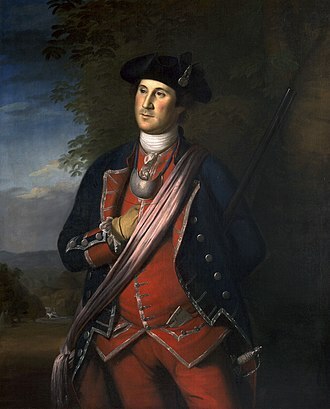 Washington, Commander-in-Chief of the Continental Army, expressed doubts, writing to his cousin in Virginia. At the time a town in New Jersey, Trenton was occupied by three regiments of Hessian soldiers commanded by Colonel Johann Rall. Washingtons force comprised 2,400 men, with divisions commanded by Major Generals Nathanael Greene and John Sullivan. Washington had stationed a spy named John Honeyman, posing as a Tory, Honeyman had served with Major General James Wolfe in Quebec at the Battle of the Plains of Abraham on September 13,1759, and had no trouble establishing his credentials as a Tory. This 19th-century diagram shows the side views of Turtle. It incorrectly depicts the propeller as a screw blade; as seen in the replica photographed above and reported by Sergeant Lee, it was a paddle propeller blade. Joseph Reed played a role in encouraging the militia's activities. Benjamin Franklin and Lord Howe had previously discussed colonial grievances. Sir William Erskine, 1st Baronet, from a print in the NPG. John Trumbull's The Death of General Warren at the Battle of Bunker Hill. Clinton is in the center background, bareheaded and holding a sword.